Uses: Ideal for medical & dental related applications. Special Features: Unique micro-chlorination process results in consistently excellent donning, a soft, comfortable fit and excellent elasticity. Textured finish provides excellent grip in both wet and dry situation. 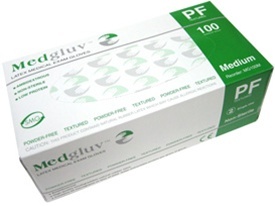 Medgluv quality powder-free exam gloves are manufactured with less than 50 micrograms total water extractable protein. These high-quality powder-free latex gloves are an excellent choice for virtually every application in a health care environment. Quantity: 100/box, 10 boxes/case (1 case = 1,000 gloves). Other: CAUTION: This product contains natural rubber latex which may cause allergic reactions.